George Rogers Clark was born near Charlottesville, Virginia, on November 19, 1752. He received little formal schooling, but in his late teens, Clark's grandfather taught him how to survey the land. In 1772, Clark put his training to use. He departed from Fort Pitt (later Pittsburgh, Pennsylvania) and rafted down the Ohio River. Upon reaching the Kanawha River, he surveyed land near the river's mouth. He visited the Ohio Country the following year as well and surveyed land on the northern bank of the Ohio River. 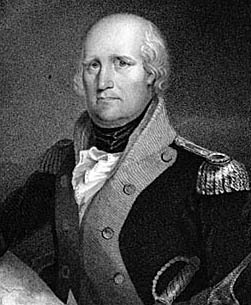 In 1774, Clark participated in Lord Dunmore's War. He served with the Virginia militia and was present at the Battle of Point Pleasant. Following the conflict, Clark worked for the Ohio Company, surveying land in Kentucky. Some Kentuckians hoped to break away from Virginia and form their own state. Clark opposed this plan, believing that Kentucky would grow much more quickly with Virginia's assistance. Once the American Revolution broke out, Clark served again in the Virginia militia. He was instrumental in protecting Kentucky from British and American Indian attacks, and the Virginia legislature rewarded him for his actions by promoting him to the rank of lieutenant colonel. In 1778 and early 1779, Clark led an army in the dead of winter and with great hardships against British outposts and American Indian villages in Indiana and Illinois. In this campaign, his greatest success was capturing Vincennes, as well as the British commander Henry Hamilton. In 1779, Clark led an army against Fort Detroit but failed to capture the British stronghold. He would spend the remainder of the war fighting against British forces and American Indians seeking to protect their lands from Americans settlers encroaching west of the Appalachian Mountains. In the early 1780s, he defeated an army led by Henry Bird. In 1782, Clark destroyed several Shawnee villages and defeated a group of Shawnee at the Battle of Piqua. On this raid, Clark also destroyed Loramie's Store, an English trading post. Following the war, the Confederation Congress appointed Clark as an Indian commissioner. In 1785, he, Richard Butler, and Samuel Parsons negotiated the Treaty of Fort McIntosh. This treaty required Ohio's American Indian peoples -- including the Wyadot, Lenape (Delaware), Ottawa and Objiwa (Chippewa); but also the Shawnee, who were not represented at the negotiations -- to leave all of their land in modern-day Ohio except for the northwest part of the state. The treaty caused much controversy in U.S.-American Indian affairs in Ohio, since many of the leaders who signed the treaty were young tribal members without the authority to speak for their people; and since Butler, Parsons and Clark reportedly got many of the American Indian delegates drunk during the proceedings. Moreover, though the treaty confined Ohio's American Indians to a reservation in Western Ohio and promised that the U.S. government would protect Ohio's American Indian people against continued white encroachment on these protected lands, the U.S. government, in practice, did very little to discourage white settlers from claiming these lands. In 1786, Clark warred against the Ohio Country American Indians for purportedly violating the Treaty of Fort McIntosh and other treaties as well. In this campaign, Clark also seized supplies from some Spanish merchants. This created an embarrassing diplomatic situation for the Confederation Congress, and Clark fell into disfavor. No longer chosen to assist the young United States in solidifying control of the western frontier, Clark now became involved in some ventures of his own. In 1788, he asked the Spanish government to allow him to form a colony for them along the western bank of the Mississippi River near the Ohio River's mouth. Spain refused because Clark intended to establish religious and political freedom in his colony. In 1793, France recruited Clark to attack the Spanish in the Louisiana Territory, but President George Washington opposed it. In 1803, Clark moved to Indiana, but he returned back to Kentucky after suffering a stroke in 1809 and having a leg amputated. He died at his sister's home in Louisville, Kentucky, on February 13, 1818. George Rogers Clark is remembered in Ohio with a number of place names. A large statue of him stands at the site of the Battle of Piqua near Springfield, Ohio.